2" And 3" Industrial Engine Driven Water Pumps Are Designed For High Pressure Transfer, Flood Recovery And Other General Purpose Applications. 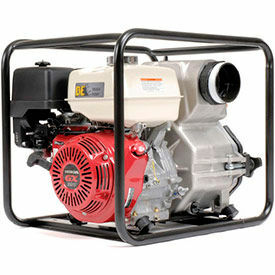 2" And 3" Industrial Engine Driven Water Pumps are solidly manufactured with nylon and aluminum for long lasting durability. Pumps can be used for transferring fluids and chemicals in corrosive environments. 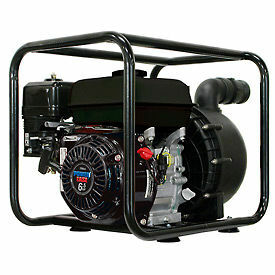 Available in 1 - 9 horsepower units with Honda, Kipor, Powerease, Powermate, Valley Vantage and Vanguard engines, tubular steel framing and nylon or cast iron impellers. Discharge and inlet connections options include 1", 2" and 3" diameters. Pumping rates range from 30 to 265 Gallons per minute. Available in .15, .53 .82, .95 and 1 gallon tank capacities. Industrial Engine Driven Trash Pumps Are Designed to Eliminate Solid and Fluid Waste For Emergency Services, Flood Recovery, and Other Maintenance Environments. These trash pumps support applications requiring high flow efficiency, abrasion resistance, and debris handling capability for mud, slurry, sewage, and other thick liquids. The pumps are constructed of heavy duty sand cast aluminum, cast iron, and stainless steel internal parts for wear resistance and durability. The easy maintenance design permits convenient trash and debris removal as well as allowing service and repair without the disconnecting of hoses. Pedestal versions (bare shaft pump) for long coupling to electric motors are also available. Units are capable of handling up to 1 1/2" solids. Dimensions vary per model. Global Industrial™ Trash & Water Pumps are used for Dewatering Applications and Removing Hard and Soft Solids. Our Trash & Water Pumps handle high pressure transfer, flood recovery, and other general purpose applications. These pumps are designed to pump large amounts of water that contain hard and soft solids such as mud, leaves, twigs, sand, and sludge. 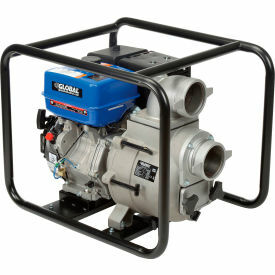 Water Pumps have a GPM of 158 and 264 with 3" intake connection and 2" or 3" discharge. Trash Pumps have maximum solid diameters of 0.787 and 1.574. GPMs are 158 and 458 with 2" or 4" intake and discharge connections. Pump fuel tank gallon capacity is 0.95. HPs are 7 or 14. Engine driven pump is non-submersible and is equipped with a low oil sensor light that will automatically shut off the engine when the oil level is below operating standards. Rigid frame prevents damage and provides an easy tie down option for transportation. Do not operate in enclosed environment.